e-Court has taken all measures to safeguard information. The website is heavily protected like internet banking with leading banking institutions. An EV SSL Digital Certificate by Entrust is installed on our web site, users can see a padlock icon in the green command bar. Extended Validation SSL (EV SSL) certificates build on the existing SSL certificate format, provide an additional layer of protection in a strictly defined issuance process to ensure that the certificate holder is who they claim to be. All data traffic between your PC and the servers of E-court.us is encrypted using SSL encryption technology (2048 bit RSA encryption). This means that all information on the Internet going (such as passwords and financial data) are protected by "intercepting the traffic on the Internet." Our servers are of the best brands and stand behind an advanced Base Wall firewall to avoid unauthorized access via the Internet. Because the servers are used to host e-Court, the firewall is so strictly configured that virtually all unwanted traffic is blocked. The data centers are designed based on the highest possible standards in the areas of security, cooling and power. The datacenter is classified as a Tier-3 data center: the highest rating in safety and reliability. The datacenter is equipped with 2 independent power supplies. This may allow for rotary UPS systems to rely on emergency generators and continuously power, incase of emergencies . 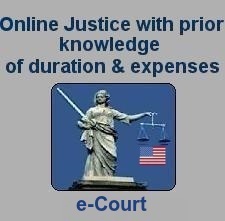 e-Court has taken all measures to safeguard information. The website is heavily protected like internet banking with leading banking institutions. An EV SSL Digital Certificate is installed on a web site, users can see a padlock icon in the green command bar. Extended Validation SSL (EV SSL) certificates build on the existing SSL certificate format, but provide an additional layer of protection in a strictly defined issuance process created to ensure that the certificate holder is who they claim to be. e-Court servers are backed up every night. This means that in almost all the calamities continuity of the stored data is fully guaranteed.